Suitable for 6-axle and 4-axle locomotives and all freight cars. 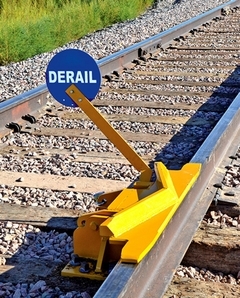 Low-angle deflection bar accommodates longer wheel base of 6-axle locomotives. Allow ample space alongside the track for derailed vehicle to slide to a stop. Six screw spikes are provided for proper anchoring to ties. Height of derail above rail, 2-3/4".